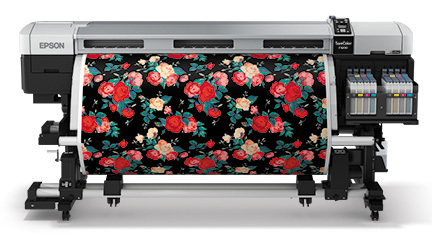 Epson's Dye Sublimation printer - the F9200 - has been named Product of the Year by the SGIA. Epson's release is below. Epson America today announced the SureColor® F9200 64-inch production dye-sublimation transfer printer has won the Specialty Graphic Imaging Association (SGIA) Product of the Year award within the "Roll-to-Roll Dye Sublimation on Textile" category at this year's SGIA Expo in Atlanta, Ga. The competition recognizes digital imaging products that keep the specialty imaging industry moving forward. "We are really thrilled with the participation from exhibiting companies, and we even doubled the product categories to correctly acknowledge all of the possible technical accomplishments honored in this competition," said Ray Weiss, SGIA's Digital Specialist. "The award winners have been extremely enthusiastic about their wins, understanding just how competitive the field was this year." A total of 141 entries in 38 product categories were submitted for this exclusive competition. Conducted during the 2015 SGIA Expo (Atlanta, Nov. 4-6, 2015), this year's event was one of the most challenging in recent history. "We are honored to receive this significant industry award from a prominent association, representing leaders in the digital and screen printing community," said Tim Check, product manager, Professional Imaging, Epson America, Inc. "This award underscores the impressive results customers can expect from the SureColor F9200 – exceptional reliability for true industrial-level production, while keeping costs at a minimum." The complete Epson SureColor F-Series line, including the 44-inch SureColor F6200 and 64-inch Epson SureColor F7200 leverage Epson UltraChrome® DS ink with an all new high density Black ink to deliver improved ink efficiency and black density with better tonal transitions and grayscale for high quality results in the roll-to-roll fabric production, customized promotional production, soft signage, and cut-and-sew sports apparel, fashion, and home décor markets. The SureColor F9200 utilizes dual Epson PrecisionCore® TFP® print heads for high-speed, industrial-level, roll-to-roll productivity with superior dot control and precise, repeatable performance. The printer also offers continuous productivity and less downtime with an integral and easily refillable, high-capacity 3-liter bulk ink system and a post-platen heater for seamless media handling and faster drying times for continuous production. In addition, the SureColor F9200 includes Wasatch SoftRIP® TX, a full featured workflow solution for textile production. Designed to work exclusively with Epson UltraChrome DS inks1, the SureColor F9200 is a complete and proven dye-sublimation printer solution that works with various sublimation transfer papers to create a range of textiles and applications, including efficient production of high-quality soft signage, sportswear, apparel, accessories, and customized promotional items with the best possible results. The complete SureColor F-Series line is on display at SGIA at the Georgia World Congress Center in Atlanta, Ga. at Epson's booth, #4345. A recap of the 2015 SGIA Expo – including the complete list of Product of the Year Award winners – will be available online at SGIA.org after the show ends. For more information about the Epson SureColor F9200 and other professional printers, visit proimaging.epson.com. Fabulous news I got to hear from this blog.I was looking for 44-inch heat transfer calendar and got to know about you.